We have total confidence in our work, so we offer the best warranty in the business. We guarantee our work 100%. * Some restrictions apply. Please ask our service professionals for details. At JJ’s Auto Clinic, we take quality seriously, and we back it up with an unheard of warranty. We sincerely thank you for your business. JJ’s Auto Clinic is committed to serving you, our customer, with professional automotive repair at a reasonable cost with qualified technicians. We use high quality Auto Parts which for the most part have a lifetime warranty. We stand on sound business principles and uphold high ethical standards. Our goal is to make your automotive repair experience friendly and successful. John and Jeff were both working for Carl Prilepp, previous owner of Carl’s (now JJ’s) Auto Clinic in Seymour when Carl approached them in the fall of 1995 and said he wanted to try something else before he retired and offered the business for sale to them. We were very excited at the prospect of being able to help so many people and full of wonder at what the future would hold. We really had no idea what we were getting into. Sure, we knew how to fix cars, and had fixed thousands of vehicles successfully, but we had no experience running an auto repair shop, or managing other mechanics. Looking back, the last 14 years have been an exciting and educational journey. Who could have envisioned the changes in the auto industry as a whole, from the new technologies and advances in vehicles and bankruptcies of 2 major auto manufacturers? Despite the challenges, we were determined to create a new type of auto repair shop, something totally unique and different from other shops. I’m pleased to say that the dream has been realized. Our shop is truly like no other- it is much better! 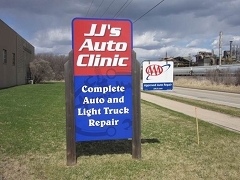 As we think about where JJ’s Auto Clinic is today, how it got here and where it’s going. We’re overcome with gratitude. We realize that you cast one giant vote of confidence when you decide to place your vehicle in our hands. We are truly thankful for every client that has made that choice and allowed us to properly service and repair their vehicles. Helping to keep them and their families safe and trouble free is our goal, and we work constantly to improve at doing that more quickly and more cost effectively. So today, thanks to you, JJ’s Auto Clinic Inc. is truly a great company! We think of each of you as a friend and special client. Owners, JJ’s Auto Clinic Inc.
So… from the bottom of our hearts and everyone that works with us, Thank You!